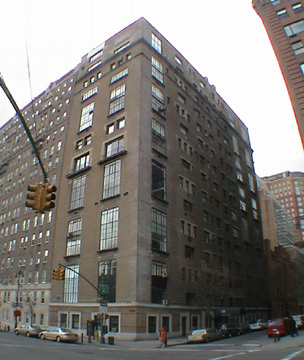 There are only two grand "studio" buildings that face Central Park: this one and the Gainsborough on Central Park South. The Gainsborough has a much lovelier façade than this 15-story, brown-brick building, which was erected in 1918 and is a cooperative with 69 apartments. This building is rather deceptive as its frontage on the park indicates that it only has only 11 floors, four with double-height windows, but its side-street façade has double-height windows only at its corners. The building's cornice, interestingly, is two stories from its top. The building's simple, canopied entrance with a limestone surround is on the sidestreet, which has several other pre-war "studio" buildings, including the Des Artistes, across the street, as well as several ABC-TV facilities. The building is across from the entrance to the Tavern-on-the-Green Restaurant in Central Park, which illuminates its trees at night. The building has a doorman, sidewalk landscaping, and protruding air-conditioners, but no balconies, no garage, no health club, and no roof deck. It has inconsistent fenestration. There is excellent public transportation nearby and the Lincoln Center for the Performing Arts and many restaurants and stores are also nearby. "In 1916 the seventh artists studio on West 67th Street, at 2 West 67th Street, turned a corner, both onto Central Park West and beyond the realm of art. The painter and illustrator Penrhyn Stanlaws had organized the Hotel des Artists across the street the year before, and for 2 West 67th Street he had the architects Rich and Mathesius design a building with a pronounced arts-and-crafts-influence. They eliminated the usual projecting cornice and finished the top of the building with simple frieze of panels and delicately worked copper coping. They used roughly textured brick on the façade and rendered it with details that emphasize a handmade character. Delays with structural steel - possibly related to the need for steel in World War I - put off completion until 1919. Plans in the building varied from floor to floor, but there were about two dozen duplex apartments with double-height studios - 19 feet high - and an undetermined number of regular apartments." It may not be pretty, but it sure has some great apartments and a great location.